Geogrids are open structures composed of pre-stressed, high strength bars, with excellent long term creep strengths. There are a number of different types of geogrids. High density polyethelyne (HDPE) geogrids are made of punched and stretched sheets of HDPE. The stretching of the sheets creates bars oriented in one principle strength direction. HDPE geogid strengths can be high, with design values possible up to 78 kN/m (5,400 lbs per ft). The strength of a geogrid allows positive reinforcement of embankments, steep slopes, retaining walls and other vertical soil structures. 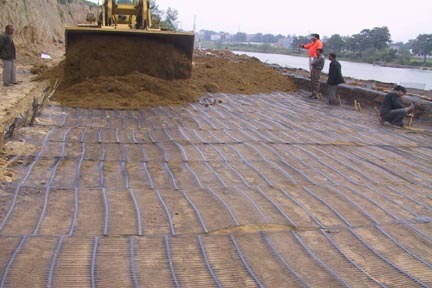 Geogrids interlock with the soil providing long term reinforcement and are the most cost effective method of creating additional horizontal space.